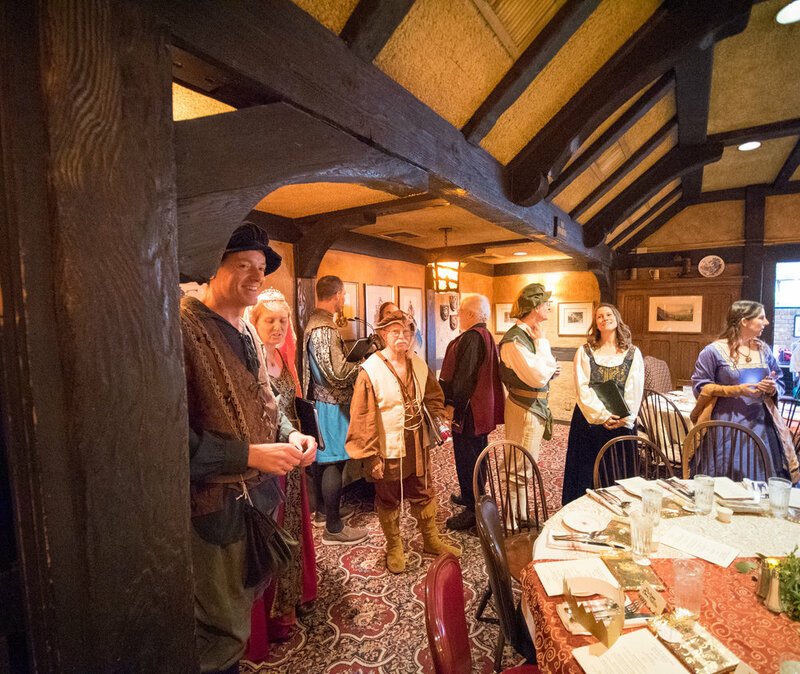 A little peek into the festivities at our Field of the Cloth of Gold Madrigal Dinner! 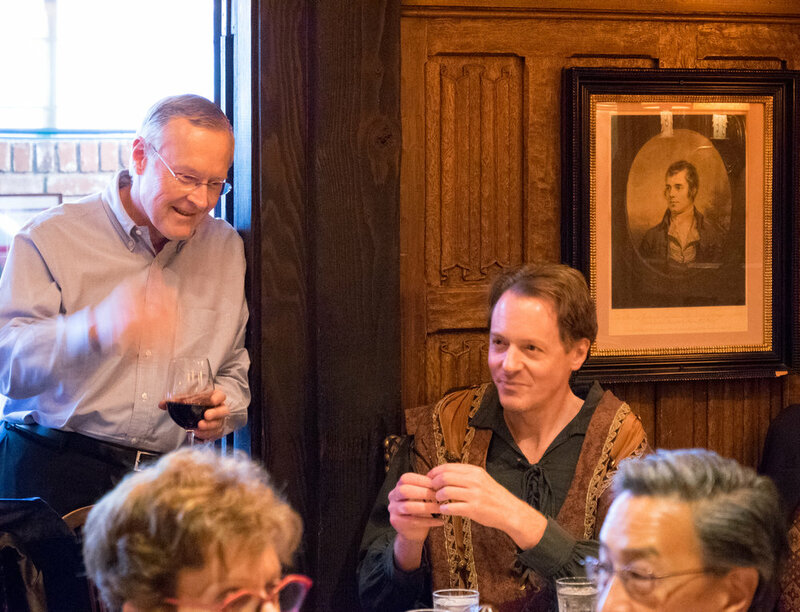 On April 22, 2018, Jouyssance and the Foundation of the Neo-Renaissance kicked off our 50th Anniversary celebration with a Madrigal Dinner. 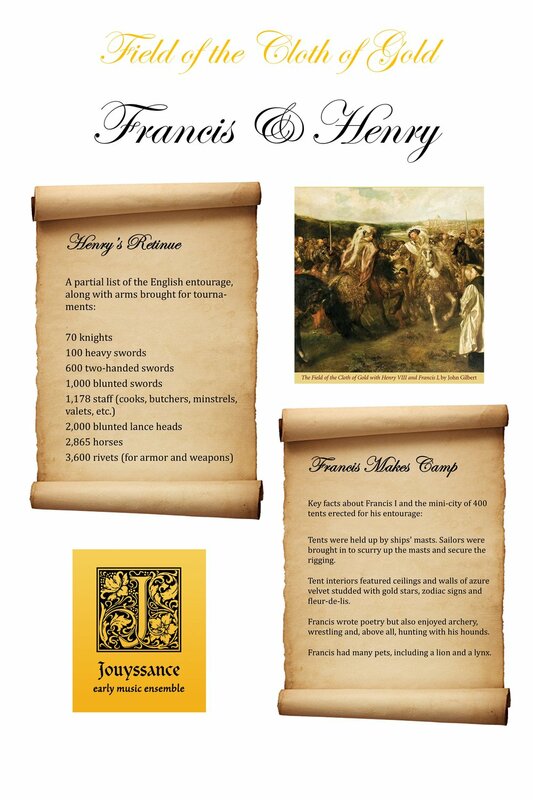 The Dinner featured music and narration based on The Field of the Cloth of Gold: a fabulous celebration during which the courts of Francis I and Henry VII put aside generations of conflict and joined together for diplomacy, feasting, music, sports, and more. In addition to the stories told during our Madrigal Dinner (including the tale of a pyrotechnic dragon released during the outdoor mass! ), we created some posters with some of the more dramatic facts and figures we dug up while researching this event. As a part of Jouyssance and the Foundation of the Neo-Renaissance's 50th Anniversary Madrigal Dinner on April 22, 2018, we will be honoring a very special member of our choir family: Phoebe Liebig. 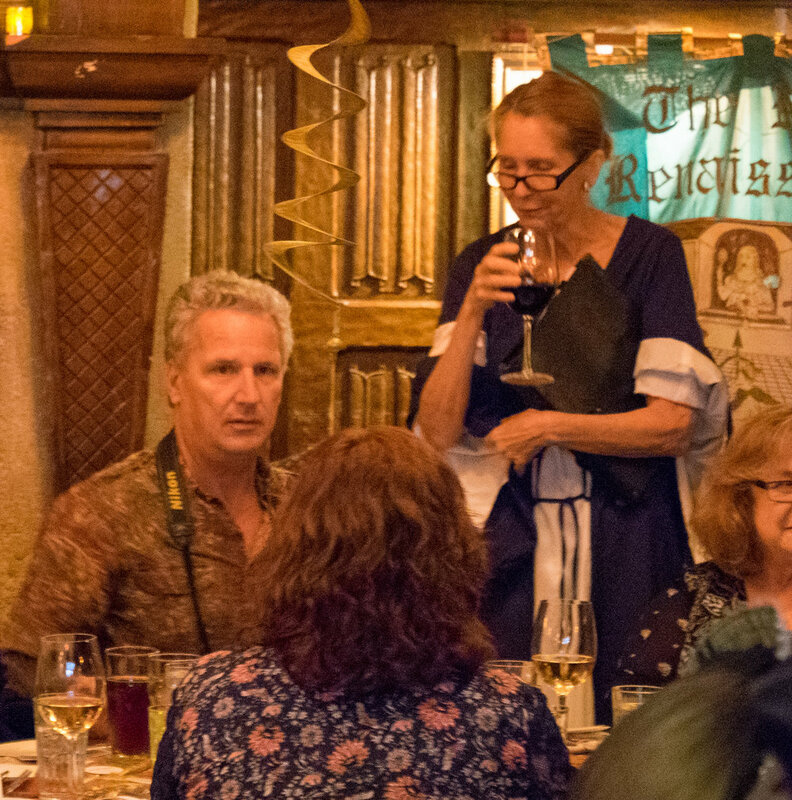 Phoebe has been an integral part of the Los Angeles early music community since she arrived here in 1954, and we are eternally grateful for her voice and her support. Phoebe graciously agreed to answer a few questions about herself for us, and the edited version of the interview is below. When did you first start singing choral music? 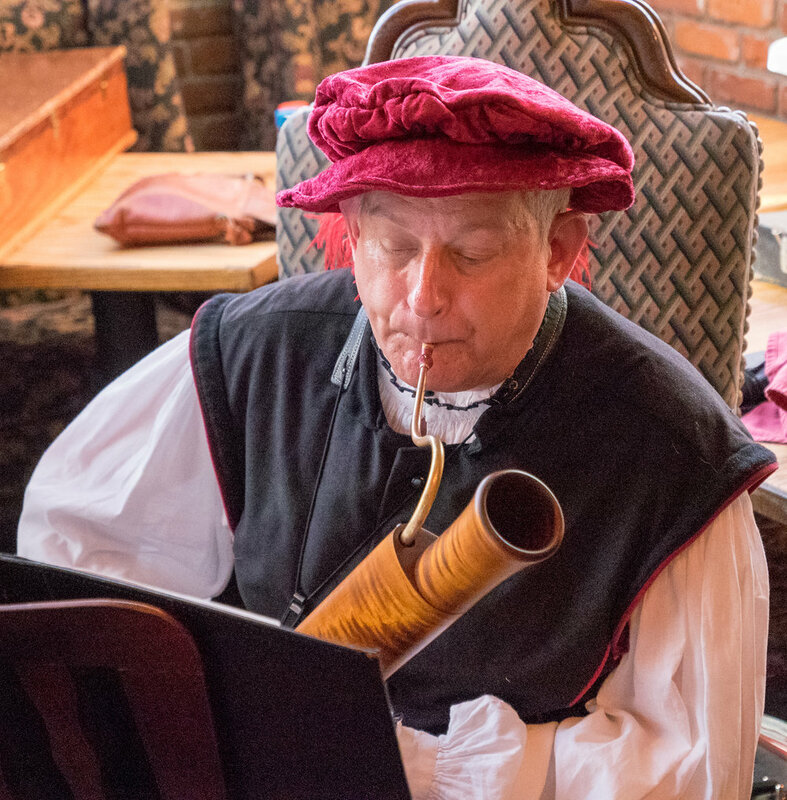 Have you always loved Medieval and Renaissance music, particularly? What do you like most about these eras? I was interested in the art of those periods (my mother was an artist): usually colorful and with a focus on human beings and their challenges. I continued to sing and took solfege lessons in Cambridge, MA where I grew up, and then choral groups in secondary school in Chicago and Milwaukee. I returned to Cambridge where I sang with the Radcliffe Choral Society and the Harvard Glee Club. When I moved to Los Angeles in 1954, I took a madrigal class at UCLA--we were offered a chance to do some TV work for a program of Stephen Foster, and that led to the Gregg Smith Singers with whom I sang until Gregg moved to NY. We did a lot of Renaissance music (as well as contemporary composers-e.g. Schoenberg) including Gesualdo and made several recordings, especially the Monteverdi Vespers. When did you first become involved in the Foundation of the Neo-Renaissance (or its predecessors)? I became involved with Jouyssance because I wanted to continue singing Renaissance music. We were a bunch of Renaissance groupies and met once a week in someone's home. John Leicester chose our name. Michael Angello was our first director and we sang in a number of places, not just churches. One of our basses, a lawyer, suggested we should create a foundation that would allow us to attract audiences and donors. The FNR was the result. Without John Leicester's passionate commitment and the mastery of our second director, Robert Faris, we would not exist today. Do you remember any early concerts or performances that particularly stood out? What about a favorite program more recently? We sang in the first Renaissance Faire that was held in a couple of classrooms in a Valley elementary school and then became regulars at the annual Faire in the Malibu mountains. We also sang in restaurants in the Malibu hills. Due to the influence of the 'sixties, we also did a couple of concerts under bridges and also with a band--the United States of America. We became a regular at the Topanga Canyon Community House, where we presented a Cloth of Gold performance. A lot of the music we chose was based on many trips to the UCLA music library. And do you have a favorite Jouyssance program? Each of them is always a new experience because of Nicole's and Rick's creativity in unearthing lots of new material. Steve Padilla's "plays" are always fun. And I love being part of the alto section (and getting to sing tenor from time to time). Do you have a favorite composer and/or style of Medieval or Renaissance choral music? If so, what about that type of music is most attractive to you? I have too many favorite composers--the Franco-Flemish group and their period are always a source of joy. Hildegard, Dufay, Josquin, Victoria and Monteverdi are my headliners. Music and art are always my sanity for what I have done in my everyday life. Do you have any hopes for Jouyssance in the future? We are so very different from when I joined in 1999. Our musicianship has gotten better over the years. My hope is we will continue to improve beyond where we are now and continue to present music that is both familiar and unique. More of same!! And I keep hoping we will work out some way to involve younger singers in a joint concert or two on an annual basis. Can you tell us a little bit about your life outside of Jouyssance and the early music community? I have had several careers: secondary teacher, TA (UCLA), software developer, grant writer, professor (USC, School of Gerontology and also at the USC Health Campus). My immediate family consists of my son (jazz artist and composer), his wife (ceramicist), grandson (writer, marketer) and grand-daughter (photographer and art). I have had two Fulbrights to India and other trips there for my research. I have served on many boards (housing, the FNR, professional organizations), have written a lot of journal articles, book chapters and encyclopedia articles, and have received several awards in the field of gerontology. I am a gardener, bird watcher, -- never have enough time to read all the books I have or to go to all the museums I want. For the last 5 years I have been focused on creativity over the lifespan (old music helps!!) and the factors that increase or inhibit that development. In June of 2018, Jouyssance will mark the 50th Anniversary of the year that our parent organization, The Foundation of the Neo-Renaissance (FNR), became an official nonprofit organization. 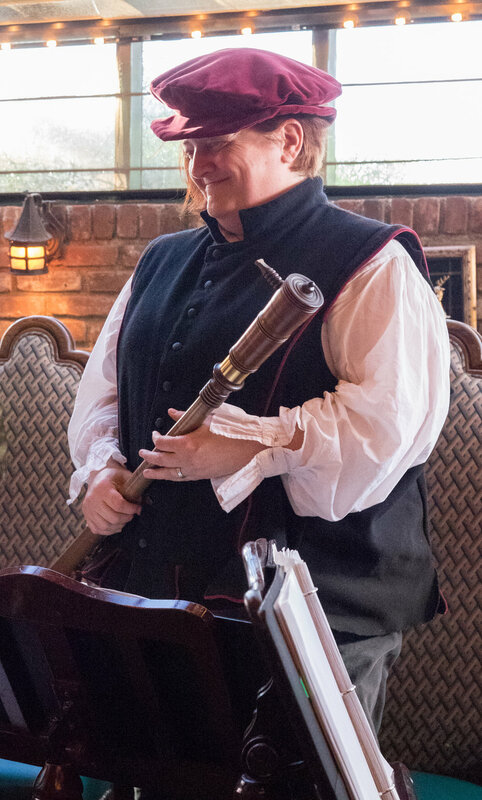 The story of Jouyssance and the FNR is the story of a community built around love for early music - a tale told in detail by Jouyssance Associate Artistic Director Rick Dechance in a 2009 essay for the Southern California Early Music Society newsletter. In the time since this essay was originally published, Jouyssance has continued to work with Artistic Director Nicole Baker to present creative, accessible programs featuring a wide array of Medieval, Renaissance and early Baroque choral music. 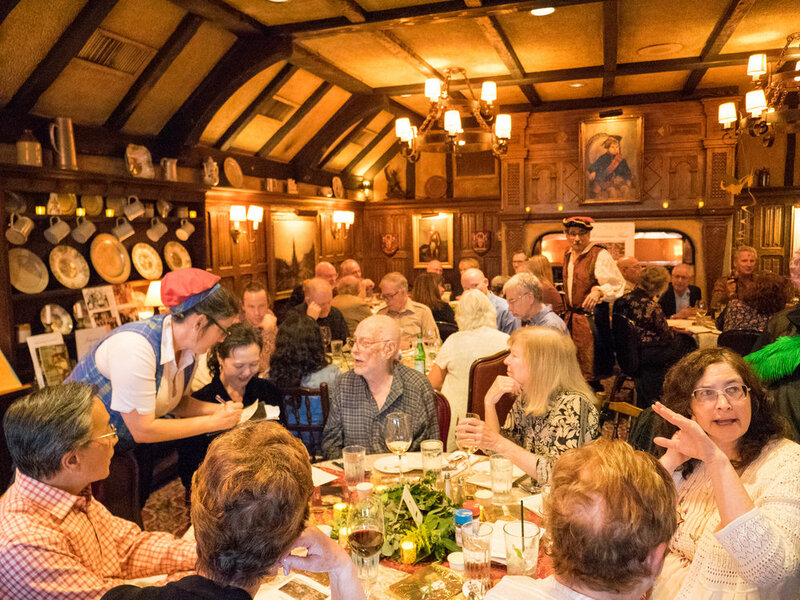 We will kick off our 50th Anniversary year with a special Madrigal Dinner on April 22, 2018: CLICK HERE to come join us! 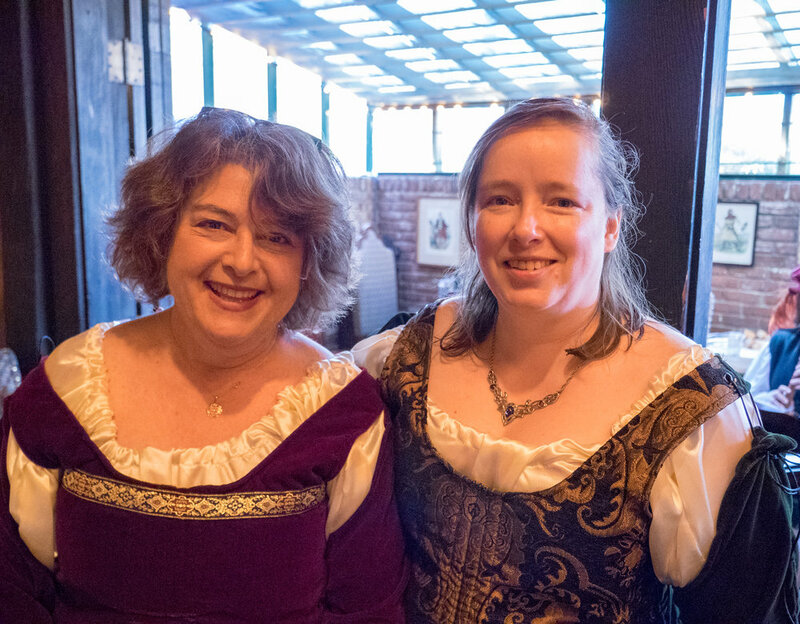 For nearly twenty years, Jouyssance Early Music Ensemble has explored and shared treasures of early music with our Southern California audiences, sponsored by our parent group, the Foundation of the Neo-Renaissance. Both organizations owe a great debt to Foundation president and steadfast Jouyssance bass, John Leicester. John, who also serves as SCEMS’ treasurer, recently retired from Jouyssance and from his position as FNR president. 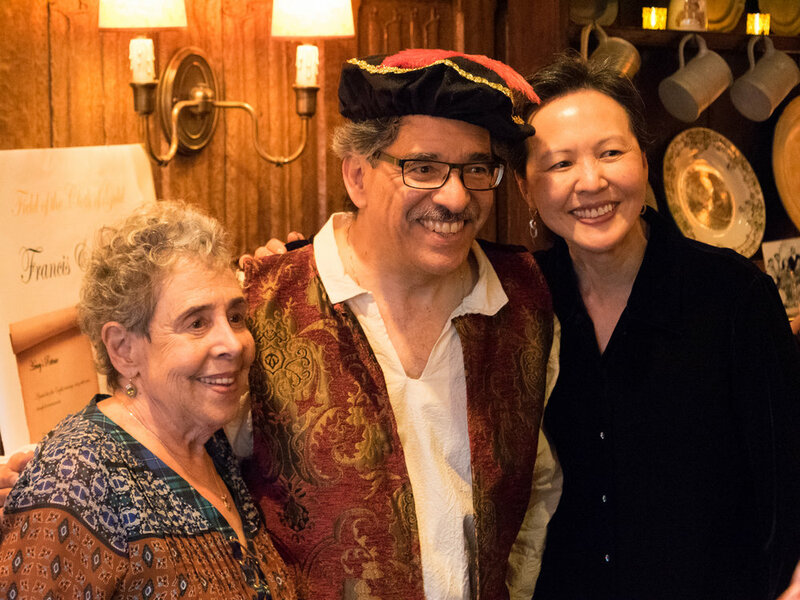 As we thank John and his devoted wife Dotty for their years of service, we look back on his legacy to us, and on the history of musicmaking that has led to today’s Jouyssance. In 1961, the groundbreaking New York Pro Musica Antiqua performed at USC’s Bovard Auditorium. Outside, a young man named Michael Agnello passed out mimeographed flyers to recruit singers for a new early music ensemble here in Los Angeles. John had fallen in love with early music back in 1947 at a live performance of Monteverdi’s Orfeo. He soon joined. This new group, called the Neo-Renaissance Singers, first performed at Loyola University in 1962. Not long after, accompanied by instrumentalists, they participated in the very first Annual Topanga Festival of Olde Musicke. When the 1967 Festival was cancelled, the Singers decided to take matters into their own hands. 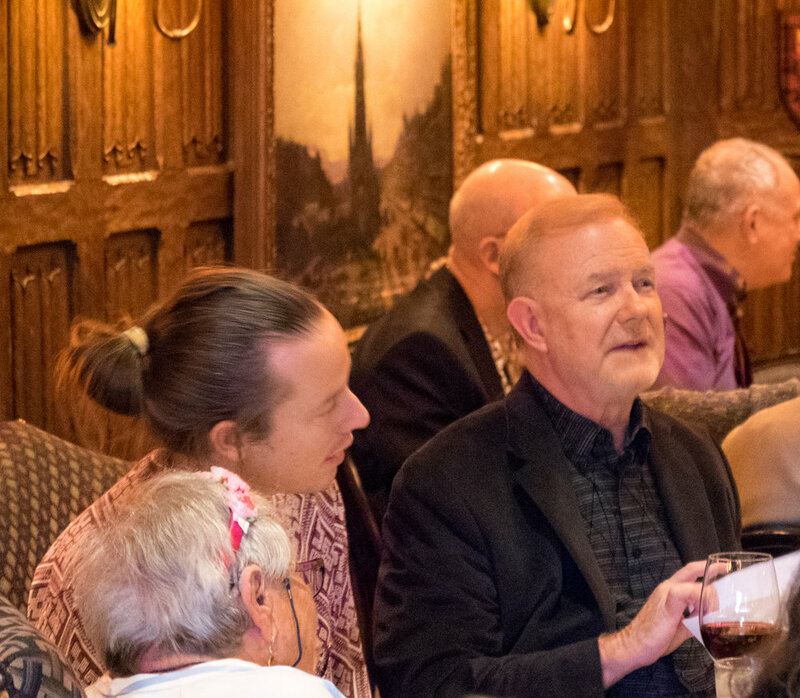 Five members, including John, formally organized a new nonprofit, the Foundation of the Neo-Renaissance (FNR), charged not only with supporting the Neo-Renaissance Singers but with encouraging scholarship and performance of early music in general. Soon after, Robert Faris took over the position of director from Michael Agnello. Through the 1970s and 80s, the group continued to perform at fairs under their medieval gonfalon. John Leicester joined Jouyssance two years later, and worked with Jim Stehn to bring Jouyssance under the FNR. Under the FNR’s sponsorship, Jouyssance became the successor to the Neo-Renaissance Singers. The group flourished under the direction of Chris Putnam and, later, Chris Kula. Jim Stehn took over as director, bringing professional singers and players into the group. During Jim’s tenure, the Jouyssance Soloists (including Belinda Wilkins, Nina Treadwell, George Sterne, Gregory Maldonado, and Bruce Birchmore) and the Jouyssance Choir presented several major concerts, including a performance of Josquin’s Missa L’homme armé super voces musicales. A recording of this Mass was released as Jouyssance’s first CD. After Jim moved out of state in 1999, Jouyssance hired Dr. Nicole Baker, a professional singer and conductor, who had previously performed with them in concert. Under Nicole’s vivacious direction, Jouyssance continued to deepen both its musicality and its role as an “amateur” group—in the original sense of the word, as a place where the singers come together out of love for the music. Her past work in arts administration strengthened the ensemble as Jouyssance developed a regular seasonal schedule of performances, created annual promotional brochures, and released a new eponymous CD. When Nicole had to step down in 2004 to care for her ailing mother, associate director Colleen Kennedy stepped out of the soprano section to serve as interim director for over a year. Colleen continues to support Jouyssance as the FNR’s treasurer, and helped arrange rehearsal space for Jouyssance at her church. During this time, Jouyssance’s instrumentalists, coordinated by longtime Jouyssance countertenor and woodwind player John Robinson, officially organized under the FNR as Jouyssance des Instruments. A yearlong search for Nicole’s successor brought us Dr. Carol Lisek. Carol combines thoughtful programming with a love of theatricality, which lent itself especially to our early baroque repertoire. Nowhere was this more evident than our first joint concert with the Los Angeles Recorder Orchestra, a dramatic performance of Purcell’s masque from Timon of Athens. After Carol stepped down to pursue her academic career, Nicole Baker returned, and is currently in her eighth season with Jouyssance. “Jouyssance” has many meanings – some of them, especially during the Renaissance period, racy – but first and foremost, it means a deeply fulfilling joy. Over a hundred singers and instrumentalists have shared our stage, and all have been touched by the camaraderie, musicianship, and sheer joy of creating music that the Neo-Renaissance Singers and Jouyssance have provided. Throughout our history, with its many changes, there has always been John Leicester. His contributions are innumerable. From maintaining the library to keeping attendance, whether through the annual FNR/SCEMS party or an FNR calendar, both as a singer and as founder and longtime president of the FNR, John has worked to create and sustain this wonderful organization that brings people together to create art and artistry. We will miss singing with him greatly, but we will never forget his gifts to Los Angeles’ musical culture, and to all of us who have had the deep and fulfilling joy of performing in Jouyssance. Jouyssance performing An International Twelfth Night at St. Paul the Apostle Catholic Church on Saturday, January 6, 2018. On January 6 & 7, 2018, Jouyssance performed a selection of early choral works from around the world for our International Twelfth Night Program. 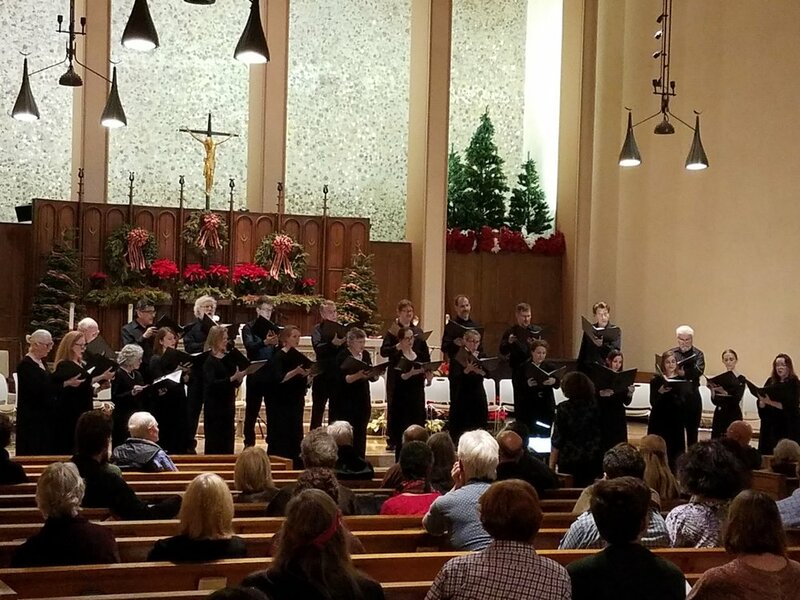 The evening featured works from five continents, including Ethiopian chant, Bulgarian carols, and Georgian hymnody, as well as classics from English, French, and German traditions. This post contains some highlights, as well as the program and notes describing the repertoire. On October 14 & 15, 2017, Jouyssance performed a program of madrigals, motets, and mass by Renaissance master Giovanni Pierluigi da Palestrina. Here are the program and notes from those concerts. Jouyssance and Los Angeles Baroque at St. Bede's Episcopal Church, June 10, 2017. Below you'll find the program, notes, and video from the event. On Saturday and Sunday, January 7 & 8, 2017, Jouyssance performed a concert featuring German holiday music. Here is the program and program notes from that event. Jouyssance performing their first concert at St. Paul the Apostle Catholic Church in Westwood. Bruce Teter accompanies on recorder.